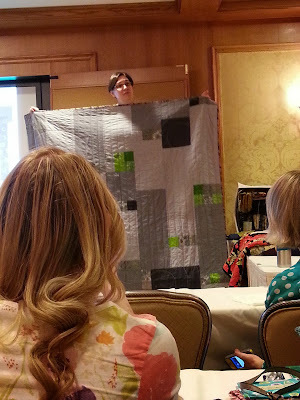 One of the classes I took at Sewing Summit was a class called Stash Mixology with Alisa Ashbury. It was quite possibly my favorite class of the weekend. Alisa is a fellow SLMQG member, but since I'm so new to the group I didn't recognize her name when signing up. It wasn't until I got to class that I realized I knew her. Alisa is definitely not your average cookie-cutter quilter. She has a distinct style that I find quite endearing. She uses any and every kind of fabric, including batiks, non-cottons, and (by her own admission) lot of uglies. She creates beautiful quilts with lots of texture and depth to them. I was fascinated by her work. I guess I would consider her part art quilter, part scrap buster, with some modern thrown in the mix. 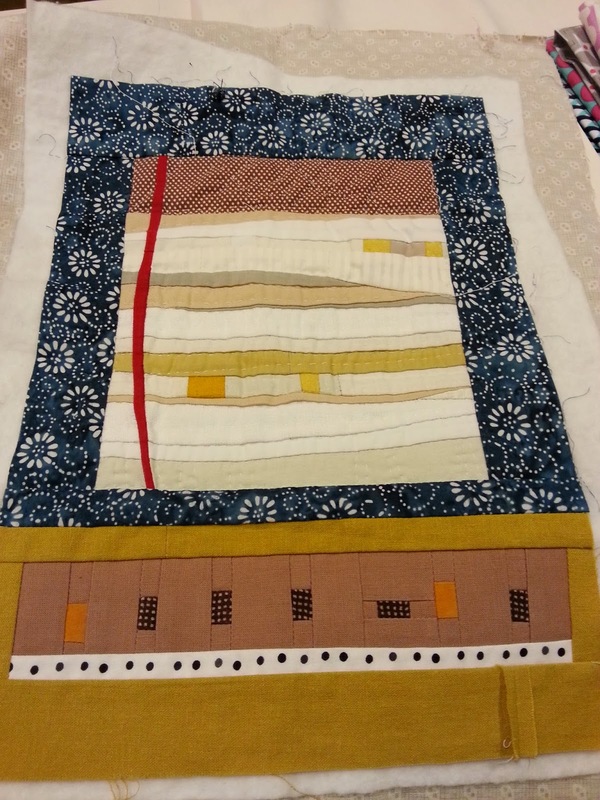 Here is a small wall quilt she is in the process of creating. She does lots of hand sewing on her quilts, both with regular and chunky style threads. Again, adding much depth and texture to the piece. Her hand quilting is beautiful! But her main point of the class was to help us break out of the mold of using only one line of fabric in a single quilt (I don't have much issue with this) and instead to think outside the box. 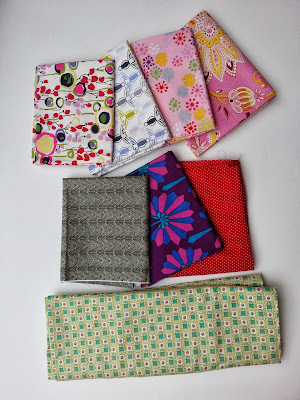 She taught us to create quilts with depth and personality using a wide range of different fabrics, including uglies! We were asked to bring some FQ's to the lecture so we could mix and match everyone's picks. As you can see, at my table there was quite a mix. We were then asked to pull fabrics from what was on the table to create a fake quilt. For some, this exercise proved harder than for others. We talked about adding depth through color value as well. The black FQ's were put on the table by Alisa. Her philosophy is that every quilt needs a little black (or navy) to give it depth. It was quite fascinating to see what a little black will add to a quilt. Again, for some in the class this was a hard concept, I could see the uneasiness in their eyes. Haha! But for me it proved to further educate and enlighten. 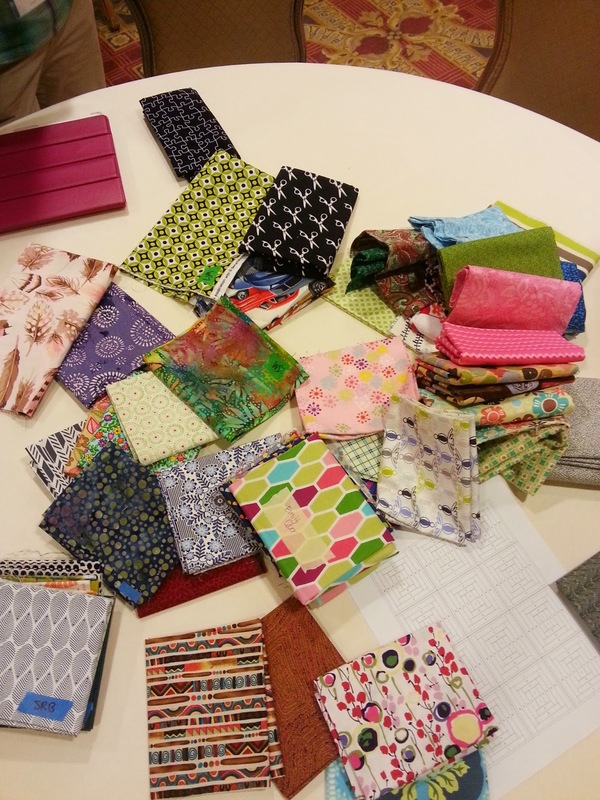 After her lecture my table did a little fabric trading. Here are the pieces I came home with. Some are definitely "uglier" than others, but I'm hopeful that can integrate them into my stash and use them freely. Quite honestly I'm seeing my quilts in a whole new light after this class. Sounds like this would've been a really good class. 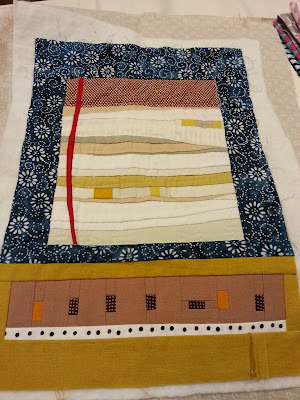 I am working on the randomness in my quilts. Sometimes it is easier than other times, but so far it has always worked out.